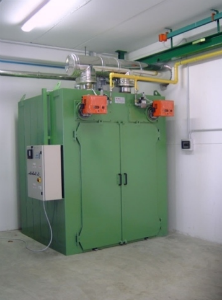 Shrink fitting furnaces are designed for temperatures up to 350°C. They are used in particular for shrink-fitting/pressing out crankshafts, train wheels, etc. Below is an example of shrink fitting furnace.